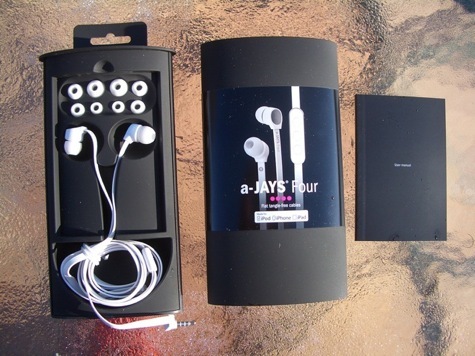 The a-JAYS Four earbuds are comfortable, resonant, well-balanced, and in most respects a fair value for the price. They are not perfect but the negatives are so minor that I’m nearly embarrassed to repeat them. For four or five days before sitting down to write this review, I used the headphones to listen to a wide variety of music encompassing everything from opera to zydeco.I listened in the quiet of my bedroom late at night and I listened in a restaurant with dishes clattering around me. I listened in my office while typing on a keyboard. Then I poked around to see what others were saying on the Internet. In the quiet places I was impressed with the snug and comfortable fit and the clarity of the sound reproduction. In the noisy places I found the noise canceling features worked better than many other headphones I own. Nothing blocks all the ambient noise, but these do a respectable job. a-Jays Four come with flat, tangle-free cables and inline mic and controls that work well with my iPhone and iPad. The three buttons can start and stop music, increase or decrease volume, and perform numerous others tasks, but you’ll have to go online to find the instructions for all the different combinations of controls.The provided manual is, like the headphones themselves, elegantly designed but minimalist when it comes to communicating as much as I wanted to know. The warnings and warranty legalese take up more space than the instructions for programming the three button controls. One pleasant surprise with the cables is that I didn’t have to squint to figure out which speaker was right and which one left. They’re clearly marked on the cable itself rather than on the speaker housing. Nice. After I listened with the a-Jays Four for four or five days, I confess I got on the Internet to see what others had to say. Some owners were angry because Jays, a Swedish company, saw fit to leave out a carrying case, not even providing a cloth sack. Frankly, that didn’t bother me at all. I just put mine in a ZipLoc bag, a practical solution but, considering the sleek design of the headphones, is a little like putting a Vermeer in a burlap bag. A more serious issue, rarely mentioned by anyone, is that you can sometimes hear a rustling sound through the earbuds when the flat cables brush up against your clothes. If I were using these while running on a treadmill, that might be an issue, but it would hardly be a deal-breaker. The earphones come with five sets of comfortable covers for the speakers ranging from very small to large. The speakers themselves are flat-backed, which makes it easy to simply press them forward into the ear until you get to a comfortable position. While listening on my iPad, I use a digital sound processing program called Bongiovi that allows the user to select the type of earphones he’s using and adjusts the sound accordingly. These earphones aren’t listed but it didn’t seem to matter which configuration I selected. The audio was always well balanced. The bass was rich but not muddy and over-bearing. High notes were smoothly modulated. The only significant drawback I discovered, and one that apparently had nothing to do with the manufacturers, is that you cannot use the inline control buttons on the iPod Classic. The company says this is an incompatibility issue of Apple’s making, and indeed Apple acknowledges as much on its website.